Last week marked the end of production of GM’s big block engine. The last of the legendary powerplants – the L18 – rolled off the line at GM’s Tonawanda plant in New York amid whistles and applause from onlookers. 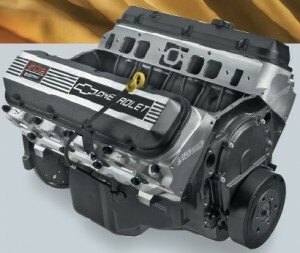 This last example of the rat motor, as it was sometimes referred to, was a staple in GM’s most popular models such as the Chevrolet Impala, Chevelle, Camaro, and Corvette. The big block had displacements ranging from the revered 396, 409, 427, and 454, to the 496 cubic-inch Vortec that ended the production run and is on its way to the GM Heritage Center in Sterling Heights, Michigan. The L18 that’s headed for GM’s Heritage Center was most recently used in the Chevrolet Kodiak and GMC TopKick medium-duty trucks. The big block had a very loyal following: when GM announced the L18 would be discontinued by year’s end, some customers ordered a two years’ supply of the engine, just to keep it stocked for future use. Besides car and truck applications, the big blocks were used by non-GM customers in pumps, power generators, and powerboats. That external loyalty was key to the big block V-8s’ long-lasting success, since the engine’s demise has been predicted (but never actually materialized until now) for over two decades. The death of the big block brings its own set of casualties: 150 hourly workers will be laid off, bringing the total number of Tonawanda layoffs to 298. The plant hopes to secure a new engine line from GM to bring back the displaced workers. While somewhat sad in the historical sense, I see this as a stepping stone for GM. The big blocks of today were really modern engines in all but name, having adopted many modern-day features and technologies. In the end, GM is hard at work in becoming a leaner company by discontinuing its Pontiac and Saturn brands while selling Hummer and Saab (maybe not the latter). In that regard, the decision to discontinue the legendary powerplant is just another step in that direction, one that will allow GM’s engineering teams to dedicate more attention to technologies of utmost importance today (such as the Voltec powertrain). Previous story Ford Launches Custom Graphics Program: A Fad Wrapped Around A Vehicle? GM’s end of a legend. The beastly, beefy big block! THIS IS WHAT HAPPENS WHEN YOU PUT A WOMAN TO DO A MANS JOB!!!! !